FREE access to Gilford Public Beach; a private, family beach within walking distance. My campground Edge of Woods( 20 sites that has 20 sites catering to 5th wheelers, RV (recreation vehicles) and smaller campers. Although we focus primarily on seasonal camping sites, we do have a few weekends that we allow short term stays for special events. 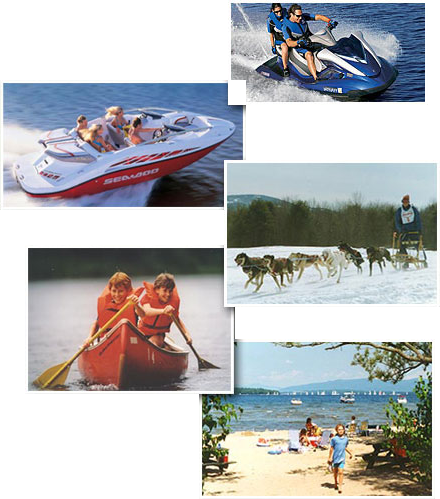 The reason I purchased this specific property is that it is walking distance to Bank of NH – Meadowbrook concert hall www.banknhpavilion.com boat rentals, Jet ski rentals, several marinas, and gunstock ski area. Gunstock ski area hosts Zip lines, horses back riding, scenic tours and much more. When it comes to sunbathing or relaxing on the beach we are a very short distance to Ellacoya state park, Gilford beach, and the famous/historical Weirs beach.